There have been many changes in business voice service within the last few years. One might even say there has been an evolution or maybe even a revolution within the industry from traditional onsite phone systems to VoIP to Unified Communications. Until recently, very few options existed for business voice service. In the past, phone systems required purchasing expensive onsite equipment and connection through a local phone provider. Today, with the help of new innovations and technology such as the internet and the cloud, business phone service has evolved rapidly from voice only communications to a connected, integrated communications platform. The introduction of more options and choices can lead to a lot of potential pitfalls. Not all providers and services are created equally. It is a whole new ballgame as far as understanding recent changes and the options that are available for business customers. Traditional onsite phone service requires purchasing equipment as well as monthly service through a local phone provider. The equipment determines both the number of internal users and the various calling features that are available. As your company grows, additional equipment has to be purchased to support additional users or new features. Bottom line for Traditional Phone service: Focused on traditional voice calling. Expensive onsite equipment. Costs to upgrade and maintain. Limited features. VoIP stands for Voice over Internet Protocol. It can also be called Voice over IP or IP telephony. VoIP is a technology that allows for the delivery of voice communications over Internet Protocol (IP) networks, most commonly the Internet. Phones connected to internet via modem. More features but still mostly just voice communications. Lower upfront costs compared to traditional phone service. Quality of service problems and lacking customer support are common issues. 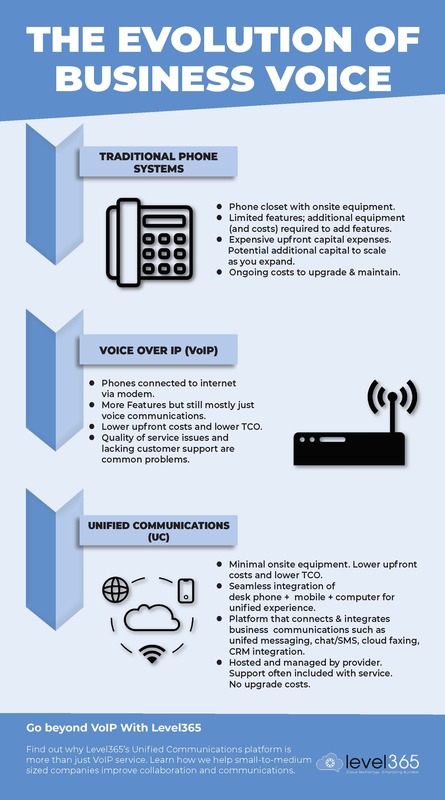 Bottom line for Business VoIP service: Still focused on traditional voice calling but for a lower cost than onsite systems. More features but also more quality issues. Lower cost approach often comes with inferior customer service and support. Unified Communications (UC) is the integration of enterprise communication services via a common platform that improves, enhances and facilitates better overall connectivity, information and end-to-end solutions. UC is more than just voice service. It allows for unified messaging, presence, SMS, Chat and connectivity to CRM systems. There is very little onsite equipment required since the phone system requirements are hosted in the cloud. New users can easily be added or removed without incurring additional capital equipment costs. No onsite phone system equipment. Phones connected to cloud hosted communications platform. Features that tie together desk phone with mobile devices and computer for unified experience. UC features extend beyond voice with unified messaging, presence, SMS, chat, CRM integrations and more. Lower upfront costs due to equipment hosted in the cloud rather than onsite. Hosted and managed by your UC service provider. Support often included with service. No maintenance or upgrade costs. Bottom line for Unified Communications service: Voice calling with more features, functionality and mobility included. Still lower cost than onsite systems and comparable with VoIP systems. Less quality issues and more integration leading to increased productivity. Your business voice service is important for driving sales and supporting existing customers. In today’s fast-paced, technology-driven business environment, your voice service provider should offer more than just voice communications (making and receiving calls). In order to support diverse teams, increase efficiency, and avoid communications gaps, companies need a voice solution that extends, integrates and connects. Business communications need to encompass a variety of scenarios, such as: multiple offices, a mobile workforce, field employees, remote workers, and call center support. Level365 offers a complete Unified Communications as a Service (UCaaS) solution with enterprise voice that is customized and scalable for your business. Our service seamlessly integrates communication among desk phones, computers and mobile devices to support remote teams and provides flexibility for onsite staff. The UC platform extends beyond voice communications with Unified Messaging, Presence, Chat/SMS, Cloud Faxing, Business Systems Integration and more.